Shifting easily among sparse electronics, extravagant synth works, dub, noise, and quiet field recording-based elegy; Backporch Revolution Records 2006 compilation “Proud To Swim Home” presents the side of New Orleans usually obscured by the huge, tottering head of Wynton Marsalis. This is the music you just knew had to exist in New Orleans– vibrant, growing, and collectively possessed of its own “flavor,” as much a compliment to the artists as to New Orleans itself. 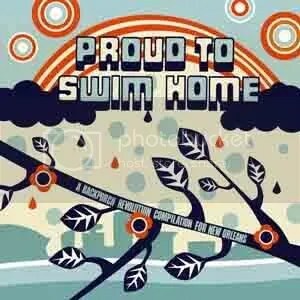 What makes “Proud To Swim Home” even more interesting is the fact that it would not have existed but for the dedication of these musicians to both their own work, and to their city; for the recording represents the artists’ work in the post-Katrina diaspora– in temporary studios, or shortly following their return to the still-beleaguered city. And while some compilations have at their heart a gimmicky theme, this one is no joke. Even with a tin ear, listeners can hear the affection and agony in Potpie’s ambient “Blues for the Lower 9.” King Ghidorah call for vengeance with “Bring Me the Head of Michael Brown,” an overdriven blast of drone guitars referencing the former FEMA “fashion god.” Archipelago conjures a darker version of Davenport’s free-folk/drone jams as they scrape the 12-minute mark with ‘The Earth Moves Five Ways,” a track suffused with low drones, dramatic vocals, and immediate drumming. With the exception of one track by The Buttons that seems a bit out of place, this is a fine compilation, and one you should check out at least to familiarize yourself with Backporch Revolution Records. This entry was posted on March 23, 2007 at 8:49 am and is filed under avant-garde, experimental, experimental music, music review, noise. You can follow any responses to this entry through the RSS 2.0 feed. You can leave a response, or trackback from your own site.